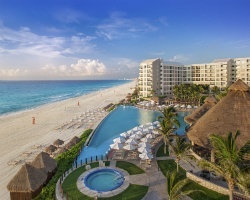 Enjoyable beachside resort in Cancun! Gold plus week 21! Buyer may receive a title fee credit, inquire for details! *Interval International Elite Resort* Featuring a finely appointed 2 bedroom, 2 bath lockout suite that will accommodate 8 guests comfortably. Usage is biennial even in gold plus season week 21. RTU in perpetuity. For more information or to make an offer, please submit the inquiry form.